Does this long red something-or-other get your heart racing? It should!! The long, slick nose see here cuts through the air with ease at a record shattering 305.596 mph. With the graceful design and three-large top speed, this 1971 Triumph GT-6 easily earns honors as Bonneville Speed Week 2011 Baddest Race Cars #5. Feel slighted that, “This isn’t the fastest car in the world! ?” Well, what is then? 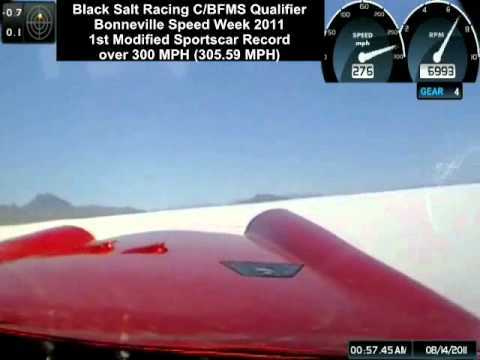 Ripping the record previously held by an Enzo Ferrari, easily one of the fastest cars in the world, by about 65 mph… that’s hot enough, but truth is, the Triumph was ON FIRE on the record backup run! More on that in a bit, let’s learn about this car. Look closely and you’ll see a 1971 Triumph GT-6. The SCTA class the Triumph and Ferrari compete in is C/BFMS. If you’re like me and still learning the classes, that’s a C engine (306-372 cu. in) in a Blown-Fuel-Modified-Sports car. Got it? So your typical small block wrapped in a not so typical body. From cowl back, the body’s all Triumph GT-6, but sports a clean 5 inch (totally legal) top chop. Looking the other direction it gets really interesting… Stretching to a total wheelbase and class max of 130 inches, the hood’s an aerodynamic masterpiece penned by Jim Cooke. Fab work went to Nicomia of Arizona. Nicomia’s a design and fabrication shop capable of, so it seams, a killer museum exhibit or a custom kitchen, or this race car nose! How’s that for diversification? With all the go-fast on this car, it’s still just a “Grocery Getter” This is a photo taken through the stock back glass of the Triumph pasted on as a sticker. Sticking with the body, I asked about wind tunnel testing. Owner/Driver Keith Copeland and crew chief Mark Hansen plan on booking time with my buddy David Salazar over at A2 Wind Tunnel. If you’re curious about wind drag and how it relates to horsepower, click the link. Being the curious engineer, I then followed up with, “Then how’d you set the length and angle of the rear wing? And how’d you choose the height of the wicker?” Mark licked one finger and held it up feeling the slightest breeze… “Like this”. So, I guess there’s some aero tuning opportunities!? The engine isn’t the NASCAR ready small block you might expect. When I asked, the team downplayed it somewhat… it’s a Brodix block and heads coming in around the middle of the C-class at 360 cubes. 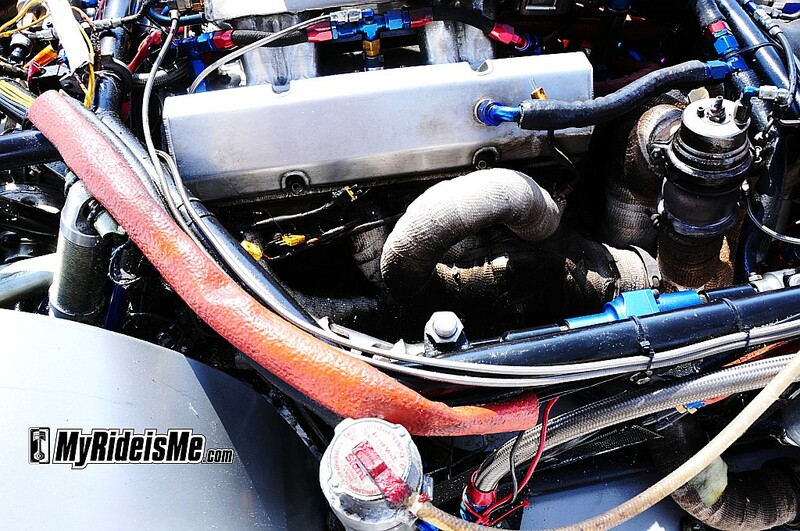 Twin turbos and an ice-charged intercooler raise the pressure just a little… The team does a phenomenal job of packing everything under the hood thanks to a custom made low profile intake manifold with Moran Motorsports electronic fuel injectors. Something you might not have guessed from the front end design? This car’s a front wheel drive. 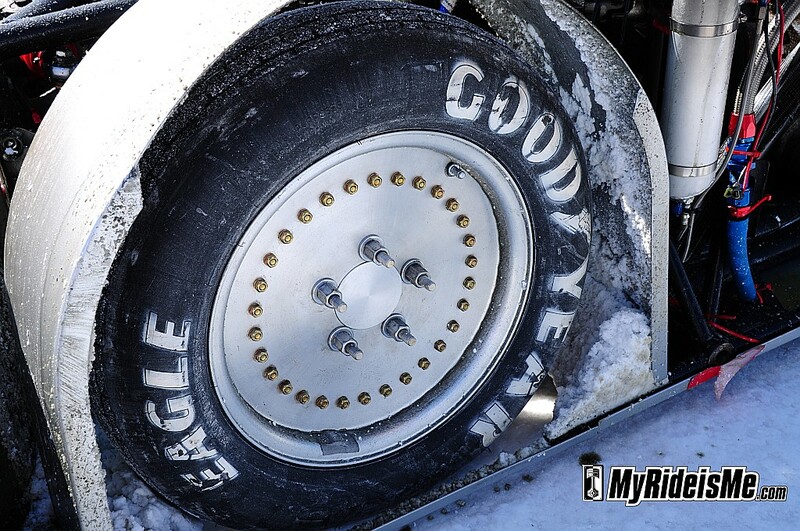 As common as that is for modern cars, that’s nearly unheard of in racing, including Bonneville. 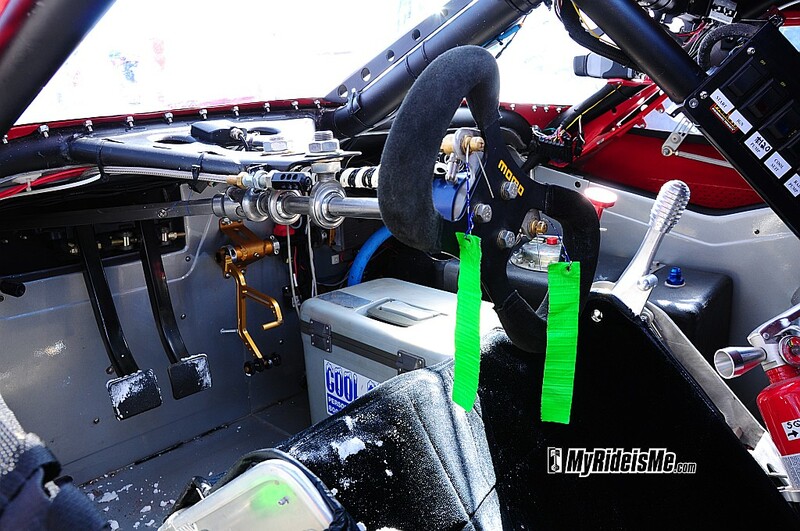 MyRideisMe.com previously learned about FWD hot rods when we featured Bonner’s Bad Berkley, the current record holder in AA and A class /BGMS. That’s the same body spec as the Triumph, but running on race gas and bigger engines. Mark added some easy to follow thoughts… “The car’s like a dart. The power and weight push the car at speed and the rear stabilizes everything. Rear wheel drive cars are like throwing the dart too… backwards.” I think these guys are right and there’ll be more super fast cars running FWD in years to come. Taking the build chores and operating as crew chief, Mark Hansen. Mark’s the owner/operator of the of Tucson, AZ shop called Strange Fab Metalcrafts. You might hear Mark built this car in nine months and Mark will only kind of confirm that. 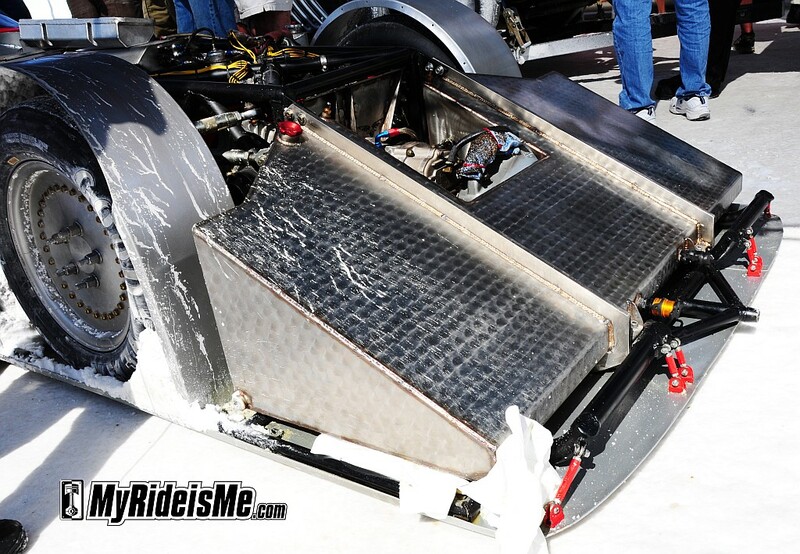 Mark and Keith put about 3 months of design work into the car before starting fabrication. Either way, in a little over a year, this car went from nothing to a record setter. During the build, no expense was spared for safety given the mishap Keith mentioned from back in 2008. “You don’t ever want to drive up on car you built that crashed” Mark explained, “It’s a bad feeling you don’t ever want.” These guys know that things can go wrong, and even though they set a massive record, things did go wrong. Except for a little wheel spin, a very clean run! On-board gauges show a 315 mph top speed and how show Keith hit 200 mph before shifting to 4th gear! You’ll also see some smoke coming from the engine compartment at the very end of the video. 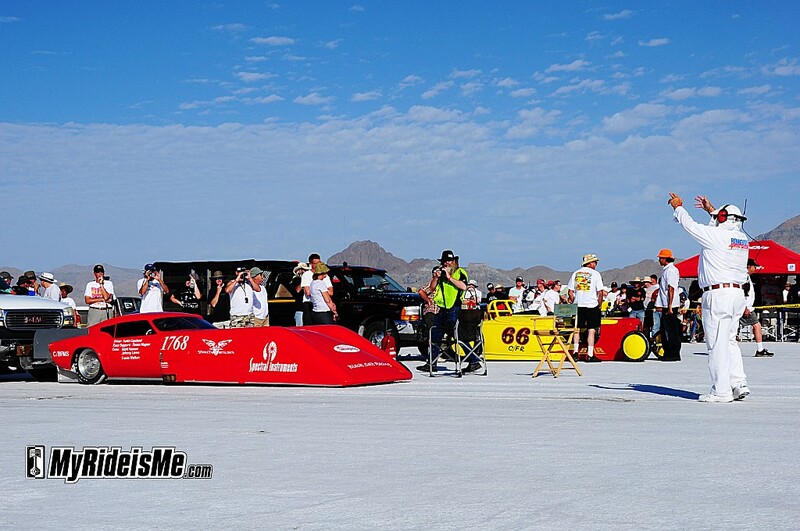 The smoke, starting from the 2 mile, alerted the Bonneville safety crew that were already en-route to Keith who pulled the fire bottles just as a precaution. The trans axle and engine oil breathers spit out quite a bit of oil causing the smoke. With only 4 hours to fix/change/repair anything in Impound, the team added catch cans and hoped for the best. That night, a roaring storm ripped through Wendover/Bonneville drenching the folks camping and partying at the “Bend in the Road” leading to the salt. The race track itself looked fine, but was a little wetter than usual. Grease Girl Kristin snapped some great photos leading out to the Salt. As one of the competitors attempting to set a record, Keith was one of the first to the line. That’s where we met. So now you know why my detail shots show a messy, charred record setting Triumph instead of a detailed and sano underhood masterpiece. Oh well, you get the idea! But hey, what’s a British car without a little oil leak? This is the cooling water tank for the car. There’s a tiny little radiator mounted elsewhere per the rules. I doubt they need it for a 5 mile sprint. Charred and melted remains of a stout Brodix race engine. 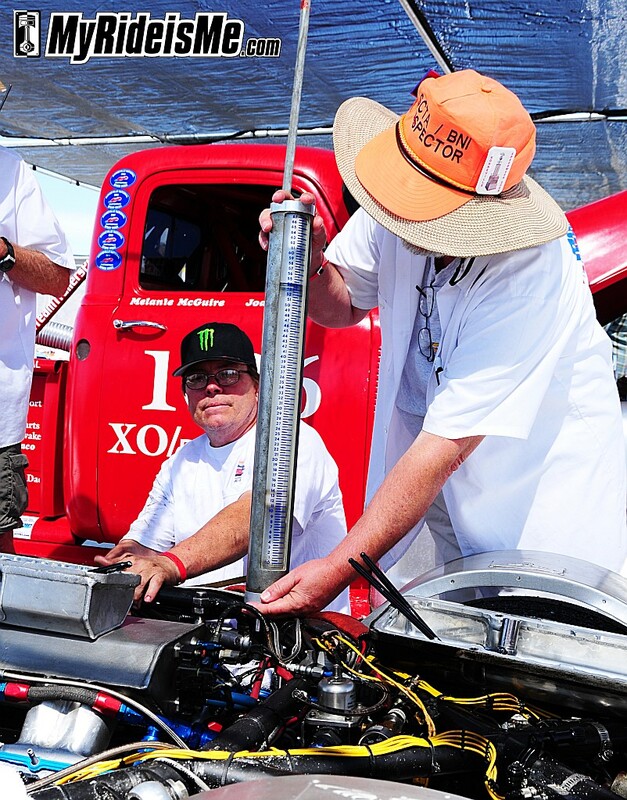 SCTA-BNI Inspection crew checks the displacement in Tech after setting the record. See the stopper at the top of the cylinder indicating the air displaced by one cylinder? Multiply by 8 and that’s your displacement. A blown head gasket kept the process interesting. It showed the displacement of 2 cylinders instead of one! 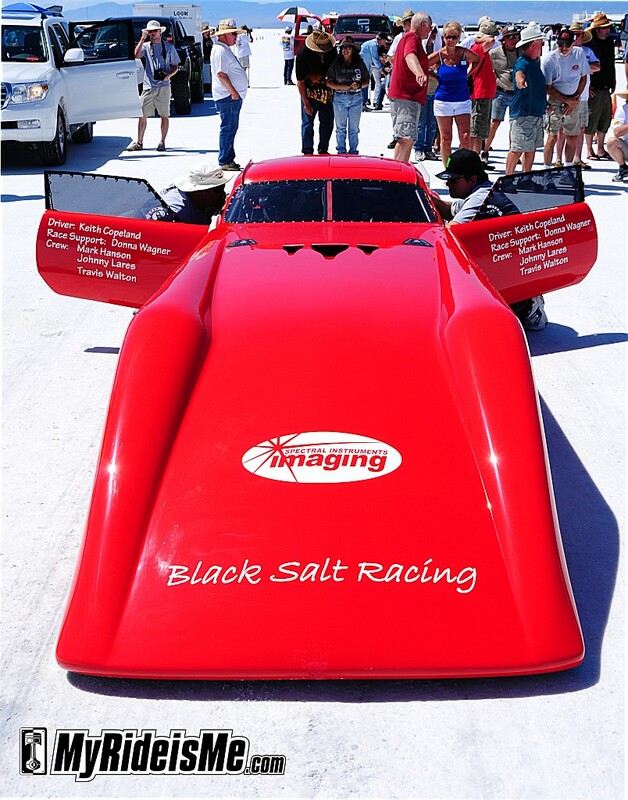 You can catch up with the Black Salt Racing crew at their website. Like everyone on the Bonneville Salt Flats, they’re great people and you’d be wrong not to say hi and be blown away at how friendly they are. So let’m know you’re proud of the slick red Triumph in a comment below! I should probably mention in every Bonneville story that the salt surface is decaying. Please take a minute to check out the Save The Salt campaign at www.savethesalt.org. All racers are concerned that we may loose this iconic racing if we can’t save the surface we race on. Like what you see? There’s more of everything Bonneville Salt Flats right here. I never seen a Triumph car before, that looks cool! Great story! He did 300 in 4th gear? Need more track! Love this car, amazing and unique! 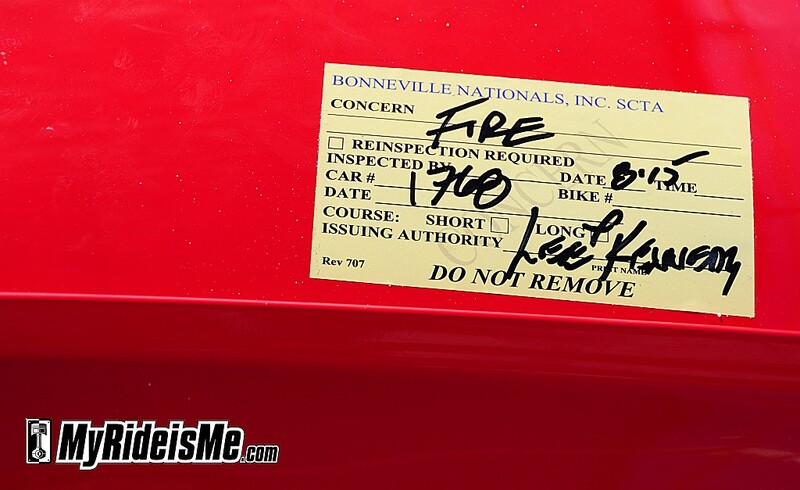 ‘Bout sums up Bonneville right there! Congratulations Keith, Donna and the whole team from Bryson City, NC. 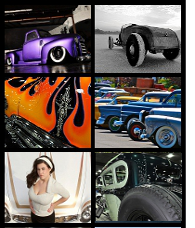 The gang at the street rod shop could hardly believe it possible when I showed them the web site. 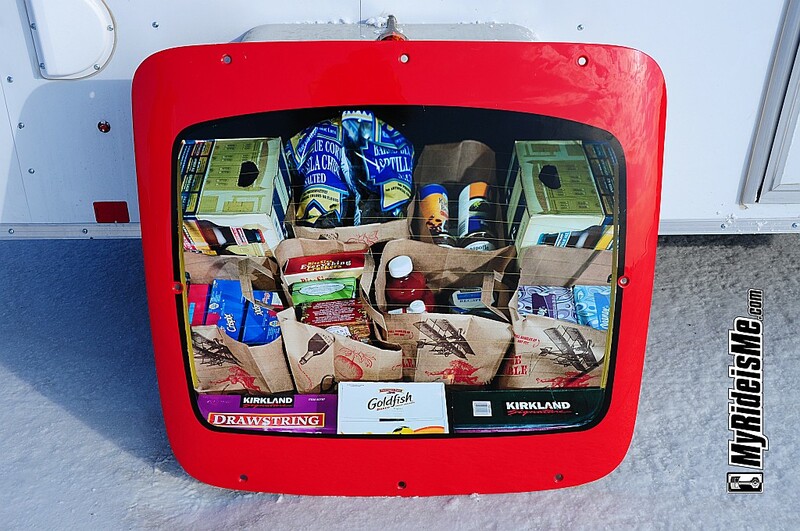 It just goes to show that yankee ingenuity is still alive and well. 297MPH and on fire.HA! Who needs painted flames when you can have real ones! Craig! Loved the story and photos! 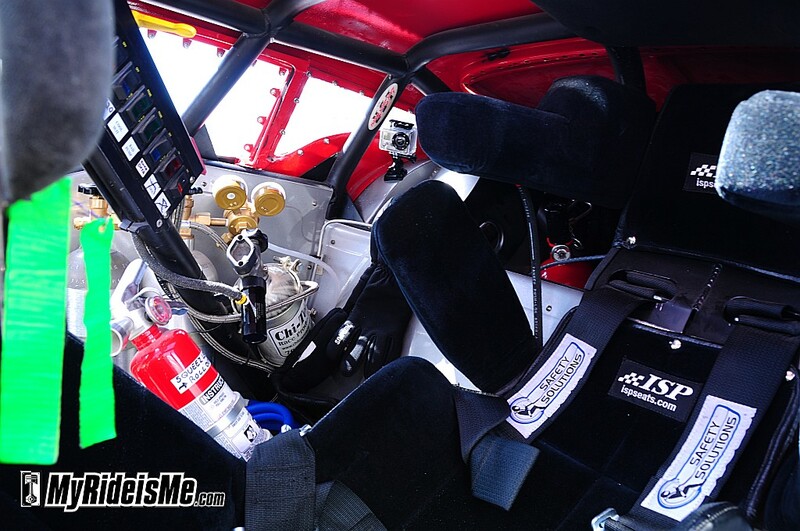 It gives the reader an idea of what goes on out there during SpeedWeek and lots of info on the car. We enjoyed meeting you and of course talking about the car and Bonneville. If ever your readers get the chance to visit during SpeedWeek, do so! It is unbelievable! Not just the miles and miles of salt flats, multitude of car types, but also the people. Not only can the fans park along the edge of the course to watch magical racing, but they can walk through the pits and chat with the teams. Pretty exciting stuff! 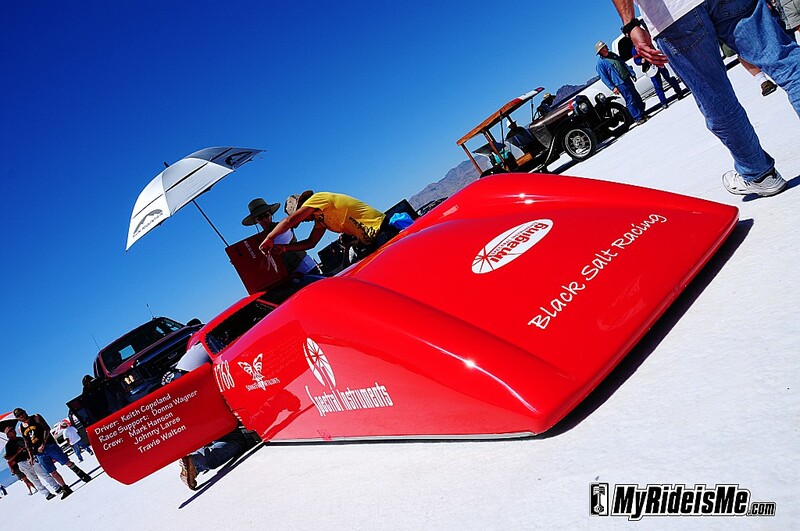 If you are ever fortunate to come out to Bonneville, stop by our pit and say hello! Then we’ll see you there Wayne! Look for the dude with the piston on his shirt and overly-bright green “media” vest. At 300 mph , you will be at home from work right after you say Wow. Pretty impressive car you have here, and the exterior just blows me away. A LOT of aerodynamics there. If there was a Triumph in there, it is long gone. I hate it when a seriously modified car is called by the name of the original “donor” car. At what point in modification does a car stop being what it started out as?? Come on Simon! If you’re a Triumph fan, you can’t be mad that these guys are running over 300mph in a Triumph, right? And, if we shouldn’t call it a Triumph, what should we call it? From the rules, from the cowl back, it’s all Triumph! The car is a 1971 Triumph GT-6 from the cowl back. The top has been chopped and the wheel base extended per the SCTA rules. Aerodynamics play the major role in achieving the very high speeds this car has set. Although the chassis and engine are obviously custom built, most of the aerodynamic drag of the original Triumph GT-6 is still present. The front end of the car is not Triumph but one of the major drag contributors is how the air exits the back of the vehicle, this is all stock. Give the original Triumph GT-6 body credit for being a nice aerodynamic design. This is why it was chosen. No other modified car has been able to reach such high speeds. The most recent one way pass of 380 mph this car achieved is streamliner-like speed and it has even more potential. Always very interesting reading and very factual. 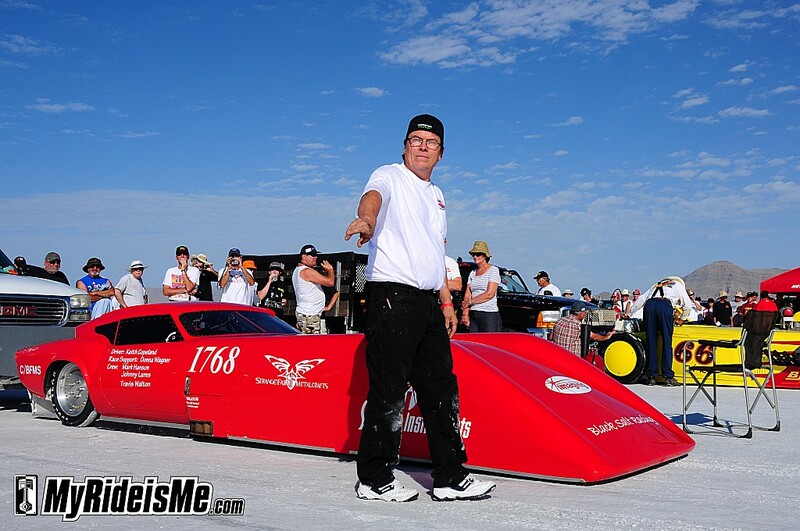 If you would be interested in a following up article you might might review Keith’s record run a the 2012 World finals with a average speed in the fifth mile at 380 mph. Now he is working to upgrade the car for a 400 mph run this year. 1. 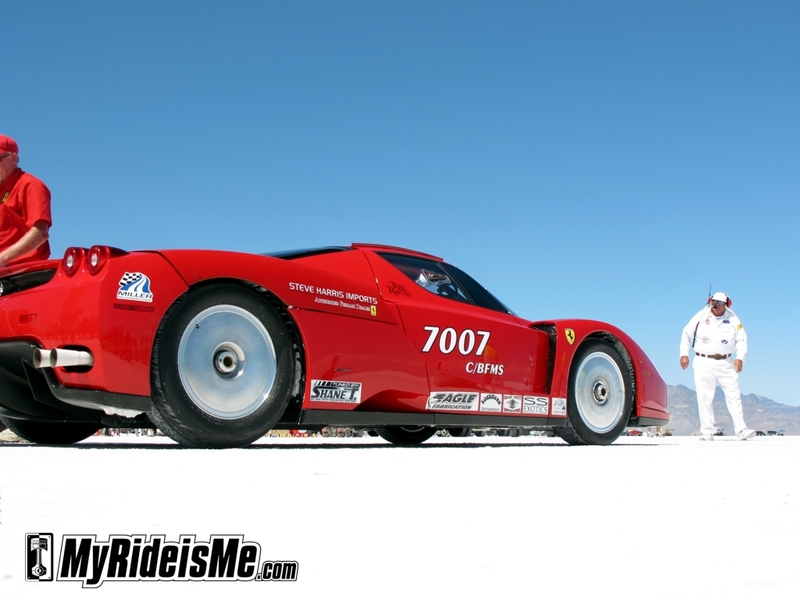 The 1971 Truimpt Gt-6: The New Speed Record is maxiumm Peak top Speed is The SCTA-Class : 305:596 M.P.H .